Would you mind adding OpenSnow.com to the safe list? Or, support OpenSnow directly for just $19/yr and enjoy no ads, 10-day forecasts, and unlimited custom alerts. Most mountains will enjoy a powder day on Sunday, and after a short break in the snow during the day, the next storm will bring snow from Sunday night through Wednesday morning. Both Monday and Tuesday should offer powder at most mountains with another 10-24 inches of snow, and Wednesday morning might be good as well. Then clouds and snow showers will linger over the northern mountains on Thursday, followed by dry weather for about one week from Friday to Friday. The next chance of a storm will be a few days on either side of February 5th. I forgot to post this picture yesterday, so here you go. This is from Irwin (cat skiing), just west of Crested Butte, on Friday, January 20th after receiving 18 inches of blower powder (snow-to-liquid ratio of 22-to-1). This was from the first storm in our series of three storms. The second storm dropped snow on Saturday, which favored the southern mountains, and on Saturday night, which favored the northern mountains, central mountains and northern part of the southern mountains (Telluride, Silverton) as the winds switched to blow from the northwest. The highest 24-hour snow totals from Saturday morning through Sunday morning are below. Now on Sunday morning, snow showers will end for most mountains and we’ll see some sunshine during the beginning of the day. Then storm #3 will arrive on Sunday night. You can see this storm spinning off the west coast. And throwing a lot of precipitation into the western US. Snow will begin again on Sunday night and continue through Wednesday morning. From Sunday night through Monday night, the flow will be from the southwest and west-southwest. 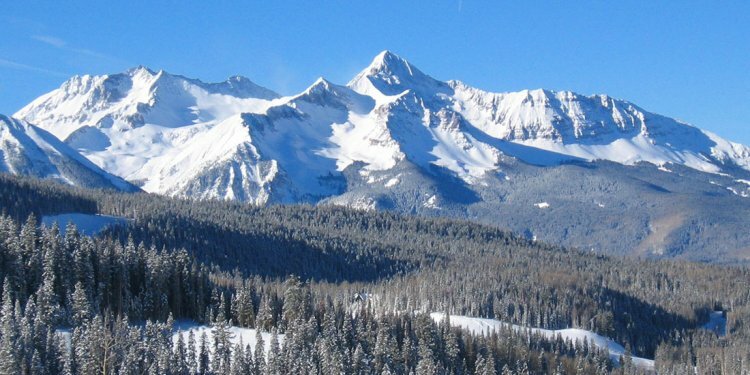 This usually favors the southern mountains and south-central mountains (Irwin, Crested Butte, Monarch). Also, the jet stream will be on top of Colorado on Monday, and this could bring intense bands of snow to the central and northern mountains, even though these areas are not favored by a wind from the west-southwest. From Tuesday through Wednesday the wind should shift to blow from the west and northwest, which should favor the northern mountains, north-central mountains, and northern side of the southern mountains (Telluride, Silverton). I have lower confidence for the forecast for this part of the storm as the models are still not converging. There could be some fluffy and surprisingly deep accumulations on Tuesday-day and Wednesday morning, but I just don’t have much more than 50/50 confidence in that. Storm accumulations will favor the southern mountains with another 18-36 inches. The northern mountains should receive about a foot, and perhaps more in spots if a few intense snow bands hit certain mountains. Clouds and snow showers should linger over the northern mountains on Wednesday and Thursday with perhaps a bit more accumulation, then Friday (January 27) through Friday (February 3) should be mostly dry as a ridge of high pressure settles over the western US. There might be a storm that side-swipes Colorado from the north or northeast between the 27th and 3rd, but for the most part we should be dry. Most models then show a chance for a storm within a few days of February 5th, so we’ll use that date for now and adjust things as the time gets closer. Thanks for reading and enjoy the pow! Did you know that you can get more from OpenSnow? All of this costs just $19 for one full year (365 days) and helps to support OpenSnow so that we can spend money and time to further improve our website and mobile apps. Joel is the founding meteorologist of Opensnow.com and has lived in Boulder, Colorado since 2003. Before moving to Colorado, he spent his childhood as a (not very fast) ski racer in eastern Pennsylvania.